Cruise ships aren’t what they used to be, and neither are the guests. They’re even better. Today’s Carnival ships offer the level of excitement of an amusement park, the entertainment of a new movie theater complex and the incredible food choices of your favorite restaurants. 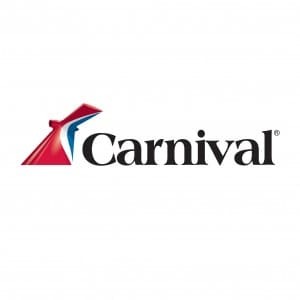 Carnival cruises are an ideal family vacation for those with even the most finicky of little eaters. Gone are the days when parents would have to exhaustively search high and low for food their kids would enjoy. 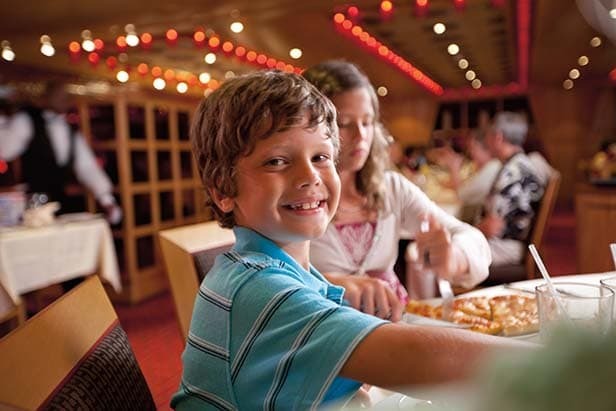 Instead, kids have an incredible choice of cruise dining dishes, ranging from the sweetest desserts to the most savory of meals and everything in between. Dr. Seuss and his beloved cast of characters have been a children’s favorite for decades. On Carnival’s Green Eggs and Ham Breakfast, kids get to dine with some of their favorite characters while eating delicious dishes inspired by all things Seussian. Colors, tastes and smells all swirl around in a dizzying combination that will delight kids of all ages, turning breakfast time into an adventure worthy of the Cat in the Hat. 1. Green Eggs and Ham: What would a Dr. Seuss-inspired breakfast be without the namesake of one of his most famous books? It truly fits its description by bringing the book’s wild dish to life. 2. Truffula Tree Pancakes: Taking a page from the Cat in the Hat’s favorite headwear, this tilting stack of pancakes and its alternating colors of crimson and white recreate the whimsical feel of the Lorax and look of the Cat himself. 3. 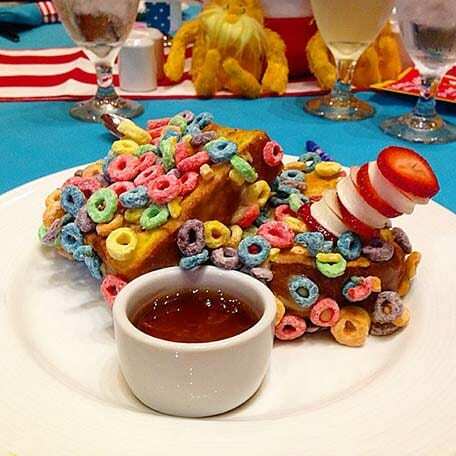 Horton’s Cereal-Crusted French Toast: The beloved elephant Horton created this imaginative concoction by fusing the kid-favorite “fruity” cereal to French toast, resulting in an encrusted delight of which kids can’t get enough. Along with other dishes inspired by Dr. Seuss, such as waffles, juices, parfait and omelets, the Green Eggs and Ham Breakfast offers a variety of standard dishes, many catering to particular diets and restrictions. 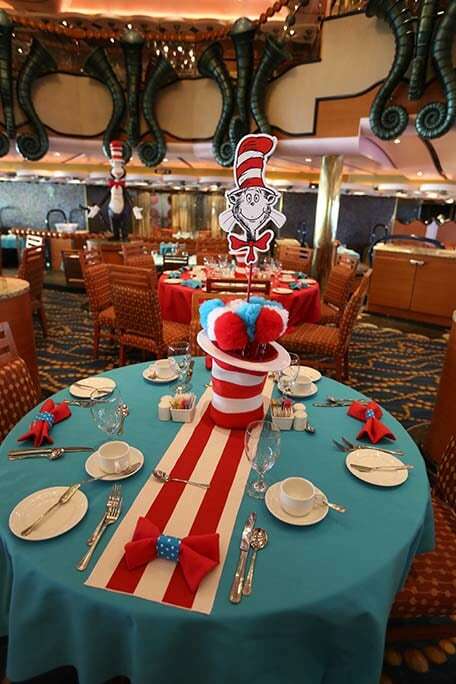 Let this Dr. Seuss-inspired event start your family-cruising day with fun and endless imagination! 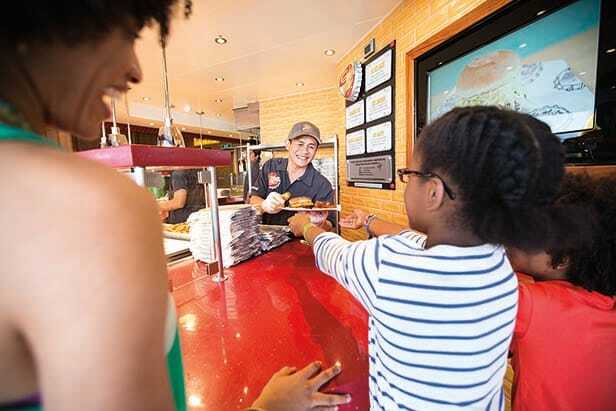 Whether it’s to refuel during an adventure-packed day aboard a Carnival cruise or a nighttime meal to cap the fun, kids have a variety of lunch and dinner choices. Ranging from ordinary dishes to something more slightly daring such as international cuisine, our younger passengers will be thrilled with the choices, as will their parents. It’s hard to find food that is more family-friendly than Italian cuisine. 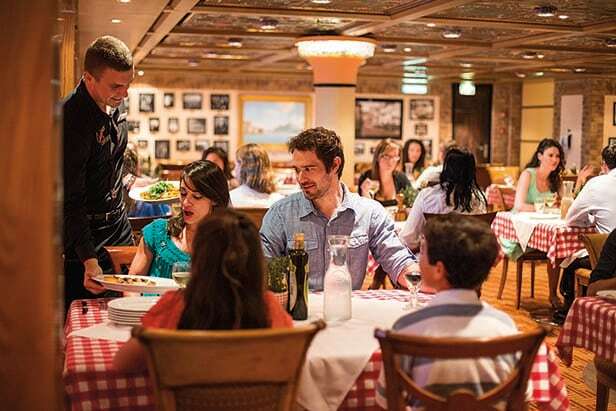 At Cucina Del Capitano, Carnival guests enjoy authentic Italian-American dishes inspired by the childhood meals of our own Italian captains and officers. Kids and their parents love the comfortable, family-style serving and distinct atmosphere. 4. Spaghetti and Meatballs: This is a childhood favorite with an authentic flavor and feel. 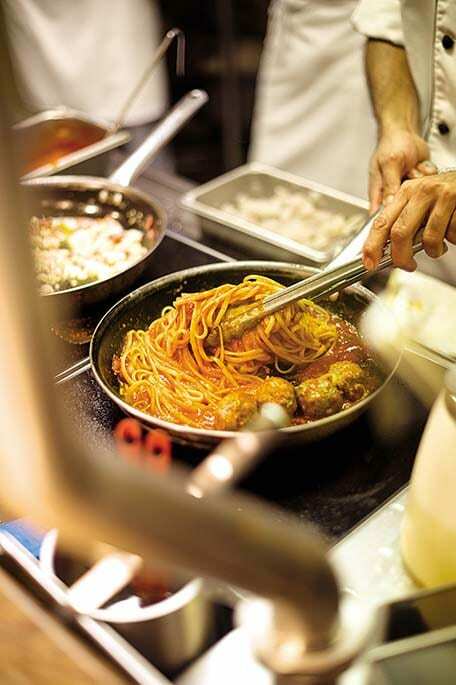 Available for both lunch and dinner, this traditional spaghetti and meatball dish is guaranteed to satisfy any Italian craving a kid might have while onboard. 5. Sicilian Cannoli: For the sweet tooth that lies within nearly every child, this Italian classic often introduces a new dessert to kids who never cease to be amazed by its unique combination of rich chocolate and sweet mascarpone and ricotta wrapped in a light pastry roll. 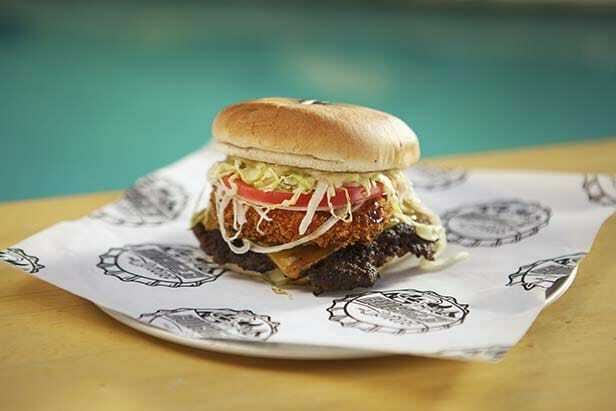 With the help of TV host Guy Fieri, Carnival’s take on the classic American burger joint offers kids a unique spin on the burgers they already love, all during an exciting family cruise. 6. Plain Jane: When the kids are looking for something on the familiar side, the Plain Jane is the perfect choice. Available with or without cheese, the Plain Jane won’t rock the figurative boat when kids are craving a meal they’ve had at home and in their favorite restaurants. 7. The Ringer: Of course, once a child gathers their sea legs and feels a bit more daring, the Ringer is a great choice to try something a little more daring based on what they already know. Slathered with Guy’s BBQ sauce and a huge onion ring, the Ringer is a Carnival favorite that kids love. All of that BBQ sauce means plenty of napkins will be needed after your child takes their first bite into the Ringer. All of the burgers at Guy’s Burger Joint come with hand cut, seasoned french fries while the toppings bar makes it easy for kids to customize their burger to truly make it their own. A cruise is a time to experience new, exciting and even thrilling moments together as a family. For that reason, Carnival also offers many dishes 24 hours a day in case schedules get a bit irregular in the midst of all the fun. 8. Peanut Butter and Jelly Sandwiches: An old-fashioned classic that’s still a childhood favorite and go-to meal for busy parents, this quick, traditional meal is available at all hours of the day and night for early-risers, night owls and kids looking for a fast, yummy dish. 9. 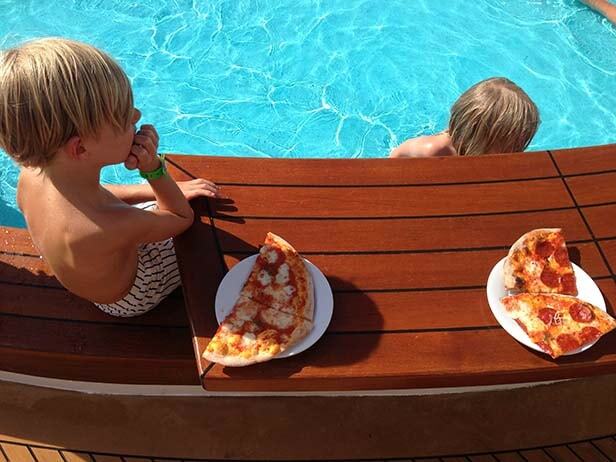 Pizza: It’s hard to find a child who will turn down a slice or two of pizza when they’re hungry. On Carnival, this perennially popular dish can be enjoyed anytime, night or day, for a delicious, kid-friendly meal. A vacation aboard a Carnival cruise is meant to inspire and create lasting memories for all members of the family, both young and old. With the many foods to choose from, including the tasty choices on the regular menus, mealtime on Carnival is bound to become a source of comfort and delight for kids and parents alike.